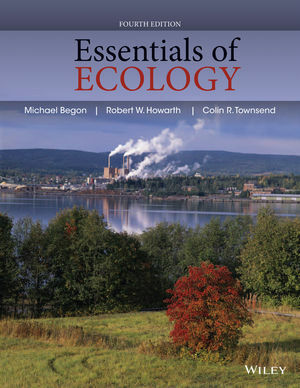 Essentials of Ecology, 4th Edition presents introductory ecology in an accessible, state-of-the-art format designed to cultivate the novice student's understanding of and fascination with the natural world. In a concise, engaging style, this text outlines the essential principles of ecology from the theoretical fundamentals to their practical applications. Full color artwork, simple pedagogical features and a wide range of carefully-chosen examples make this book an ideal introduction to ecology for students at all levels. Robert Howarth chairs the International SCOPE Biofuels Project, directs the Agriculture, Energy & the Environment Program (AEEP, formerly AEP) at Cornell University, and represents the State of New York on the science and technical advisory committee of the Chesapeake Bay Program. He is the Founding Editor of the journal "Biogeochemistry" (Editor-in-Chief from 1983 to 2004). He has worked extensively on environmental issues related to human-induced changes in the sulphur, nitrogen, phosphorus, and carbon cycles, the impacts of global climate change, and interaction of energy systems and the environment. Dramatic changes have been made to the art program, freshened up with new “thought bubbles” that highlight the important takeaways from complex figures. Structural changes to the text (now 5 sections instead of 4) and expansion of certain topics, but maintained accessible text length. Expanded coverage of ecosystem science and biogeochemistry, including extensive attention to both terrestrial and aquatic ecology and how ecological principles apply equally to both types of environments. Hundreds of new studies added to demonstrate both fundamental and applied aspects of ecology. This text has been written with an understanding of the scope of problems facing us (the unsustainable use of ecological resources, pollution, extinctions and the erosion of natural biodiversity) and conviction that the means to counter and solve these problems depend absolutely on a proper grasp of ecological fundamentals. Key Concepts - summarized at the beginning of each chapter. Historical landmark boxes emphasize some landmarks in the development of ecology. Quantitative aspect boxes set aside mathematical and quantitative aspects of ecology so they do not unduly interfere with the flow of the text and can be considered at leisure. ECOncern boxes highlight some of the applied problems in ecology, particularly those where there is a social or political dimension. In these, students will be challenged to consider some ethical questions related to the knowledge they are gaining. Marginal headings provide signposts of where you are on your journey through each chapter – these will also be useful revision aids. Summary and Review questions – included at the end of each chapter. Some questions are designated as challenge problems.